The Lizzie Borden House is located in Fall River, Massachusetts. The infamous axe murders of Andrew and Abby Borden occurred there in 1892. Lizzie Borden, Andrew Borden's daughter, was charged with their murders, but was acquitted by a sympathetic all-male jury in 1893. We must not forget this event was a huge tragedy, and that two innocent people violently lost their lives. 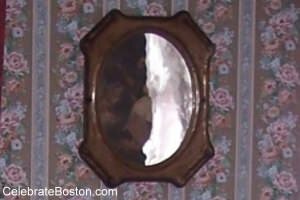 The Lizzie Borden House is reputedly haunted. This author had taken the one-hour tour of the house. The staff was extremely knowledgeable and courteous. The tour can be described as very creepy. If one finds morbid or scary subjects exhilarating, the Borden House is a destination to visit. Guests can stay overnight, and can actually book specific bedrooms for the visit on an availability basis. Rooms in the house with purported paranormal activity include the parlor where Andrew Borden was murdered, the John Morse bedroom where Mrs. Borden was killed, and the basement where the murder weapon was hidden. Waiting for the tour to begin in the gift shop builds excitement, which likely influences the experiences of people once inside the house. TV shows about visiting "haunted houses" have described feelings of hot or cold, of breezes or stagnant air, seeing shadows or spots of light, and even feeling emotional sensations such as happiness or sorrow. Andrew Borden was killed in the parlor of the Borden House. Visitors on the tour experienced a "creepy" feeling in the parlor, but in my case no other sensation. In the John Morse bedroom, where Abby Borden was killed, several visitors experienced what might be considered paranormal events. A few people, including this author, stood on the spot where Mrs. Borden was killed. People closed their eyes, and stood still and silent at this location. The first person stood there, and appeared to have shaky legs after only a few moments. Another person stood there and exclaimed they were pushed or kicked in the back. This author is extremely skeptical of paranormal activity. When I stood there, I made sure my feet were perfectly aligned, and that I was standing on steady floor boards. I folded my hands and placed them on my abdomen, to ensure I was completely balanced. I closed my eyes for about 15 seconds, and then experienced what felt like something pushing up from under the front part of my feet. I instantly opened my eyes and walked away, stating "that's enough for me." The sensation at the moment can be described as a greeting "How are you today? I just wanted to say hi!" There did not appear to be any contraptions in the room that could have influenced the experiences of visitors. But again, my experience was undoubtedly that of my imagination, but others can draw their own conclusions when visiting the house. Due to time being available at the end of the tour, we also went down into the basement where the murder weapon was discovered. Areas of the basement were dark, and it was colder than the rest of the house. I did not feel any sensation while in the basement, but when leaving I experienced an instant headache. I was a bit cranky for about an hour after leaving the house, which started in the basement. A normal explanation of course was that it was a hot day and I was very dehydrated, which caused my headache. In summary, the Lizzie Borden house can likely be considered a thrill seeker's paradise for those who believe in paranormal activity.